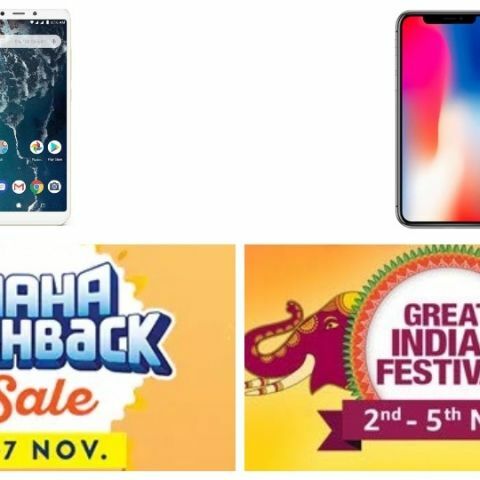 Gift yourself or a loved one a new smartphone this Diwali as Amazon and Paytm Mall host yet another sale. Read on to see which deals are best. Something of a lifestyle device, the RealMe 1 borrows technology from Oppo to create attractive selfies. It comes with a Helio P60 chipset, 6GB of RAM, and 128GB of internal storage that can be expanded up to 256GB with a microSD card. Its 18:9 6-inch display has a resolution of 2160 x 1080 pixels. The battery is a 3,410mAh unit. The Mi A2 combines everything that’s good about Xiaomi design with Google’s successful Android software programme, Android One. The Mi A2 is powered by a Qualcomm Snapdragon 660 chipset with an octa-core processor and 4GB of RAM. Internal storage available is 64GB. The display is a 5.99-inch Full HD+ unit and the battery, a 3,010mAh unit. The Samsung Galaxy A8+ scores high in the looks, battery, and build departments. It’s also IP68-rated for life on the go. It’s powered by an Exynos 7885 chipset and 6GB of RAM. Storage available internally is 64GB. The display is a 6-inch Full HD+ AMOLED unit with an aspect ratio of 18.5:9. The battery capacity is 3,500mAh. They say the only way to buy an iPhone on a budget is to get the last-generation model right after the launch of a new generation. This is applicable to the iPhone X as well. Now that it has been succeeded by the iPhone XS and the iPhone XS Max, the iPhone X is finally available for a price that’s on the healthier side of Rs 70,000. Its 5.8-inch display has a notch that continues to inspire many Chinese smartphone makers. Internal storage available is 64GB. The Apple iPhone 6S may be several generations old now but it’s still an iPhone, and is still supported by Apple for iOS updates. The iPhone 6S has a 4.7-inch display, a 12-megapixel single rear camera, and a 5-megapixel front camera. The internal storage available is 32GB. Get this model if you want to enter the world of iOS devices but don’t want to spend too much.